Online Applications are invited for the posts of ASSISTANT PROFESSORS (60) in the following Departments/Centre. 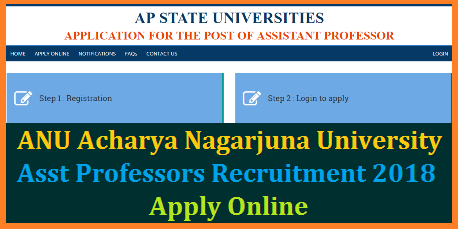 For the Registration, Submission of Online Application with eligibility criteria, Research, Experience, Registration fee and other details, please visit the website http://www.sche.ap.gov.in/ ASSTPROF/Masters/Home.aspx and go to the link of the University website www.anu.ac.in. Last date for submission of online application is 25.01.2018. Filled in online application along with acknowledgement of Registration fee, can be downloaded and the same (hard copy) should be submitted with all necessary documents to The Registrar, Acharya Nagarjuna University, Nagarjunanagar – 522 510 on or before 30.01.2018 by 5 PM. In addition to the minimum qualifications as per the UGC regulations, 2010 amended from time to time, the Candidates shall have to appear for the screening test conducted through on-line. The screening test will be conducted either by the University or any other agency entrusted by the University. The date and venue of the on-line screening test will be communicated through the registered e-mail mentioned in the application of the Candidate. Further, the date of screening test will be communicated through the University website. The Candidates are informed to browse the University website for latest updates. The syllabus of the screening test is hosted on the University website. The test will consist of two papers. Paper I, common to all Candidates, will be Teaching and Research Aptitude, while Paper II will be the subject concerned. Paper I and Paper II put together are for 300 marks. Paper I will contain 120 objective type questions for 120 marks (each question carries 1 mark). For Paper II, the Candidates have to answer 180 objective type questions for 180 marks (each question carries 1 mark). Duration for Paper I is 2 hours & for Paper II duration is 3 hours. There will be negative marks for each wrong answer. Each wrong answer will carry 1/3 negative mark for the question. The minimum qualifying marks in the on-line screening test for consideration of an eligible candidate to the oral interview in case of OC category is 40%, BC category is 35% and for SC, ST and PH categories is 30%. The Candidates, who qualify in the screening test, shall be called for oral interview according to the terms and conditions notified in the advertisement by the University. Hall tickets can be downloaded 7 days before commencement of the on-line screening test.